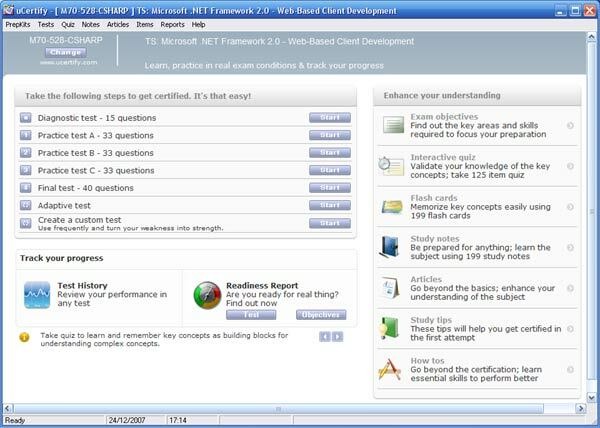 I was kindly sent a uCertify PrepKit for review back in December last year for the Microsoft C# .NET 2.0 Web-based Client Development exam (70-528). 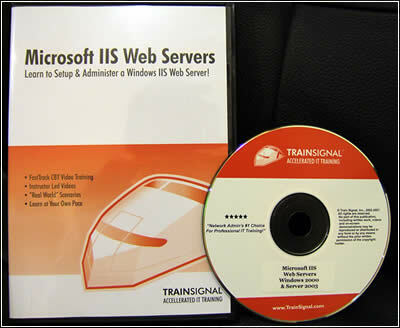 I'm looking to take the Microsoft MCTS .NET Framework 2.0 Web Applications certification this year, and needed an exam simulator and part of my study. 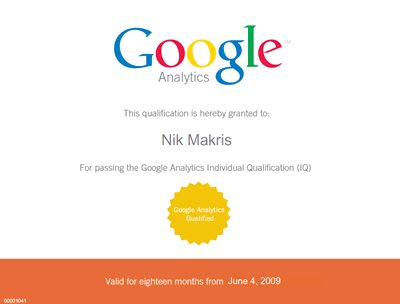 I've been so busy lately its been difficult to find the time to sit down and put the exam simulator through its paces. Anyhow I've spent a good few hours testing my .NET knowledge with this PrepKit to allow me to confidently evaluate it. 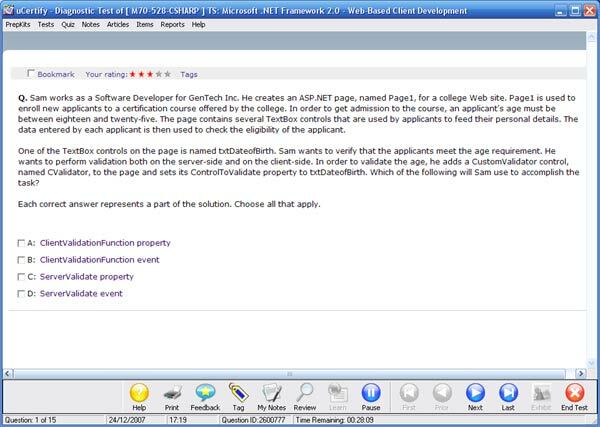 The PrepKit features a bunch of questions that closely follow the style of questions featured in the Microsoft exam, obviously the PrepKit does not contain real exam questions, but uCertify claim they are "realistic", and they are supposed to get you used to the kind of questions you should expect to see when you come to take the real exam. The tests in the PrepKit contain between 15 and 40 questions each and youâ€™re given 120 minutes to complete each one, but I found that choosing a shorter time and reducing the amount of questions I needed to answer allowed me to spend more time using the PrepKit, because I donâ€™t often have 2 hours of uninterrupted revision time. There are two different modes to choose from before starting a test. Learn mode and Test mode, Learn mode allows you to get feedback on the current answer immediately whereas in Test mode you can only review the answers at the end of the practice test. When you complete a test you can review the questions and go back and look at any questions you may have answered incorrectly. You can also choose to re-take just the questions you got wrong. When you re-take the test the multiple choice answers change order to keep you on your toes! During a test you can pause the timer to take a call, make a coffee etc, tag, print, review and bookmark questions. Every test you take with the PrepKit gets recorded in the Test History section, from here you can go back and review all the practice tests you've taken, review all the questions you got wrong, re-do the whole tests or re-do only the questions you got wrong. 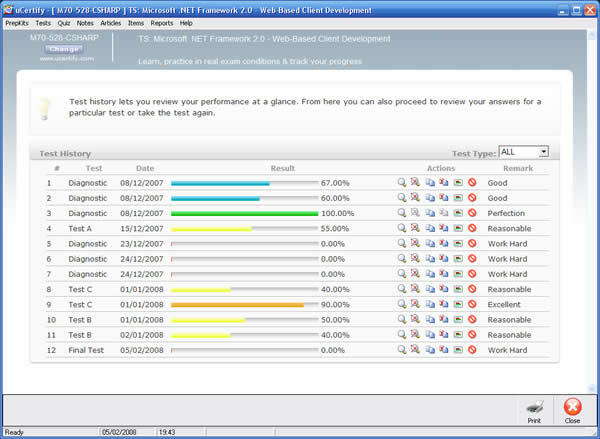 Custom tests can also be created to turn your weaknesses, based on your test history or certain topics into your strengths. Besides the practice tests the PrepKit contains study notes, quizzes and tips and flash cards to help assist you in understanding the topic.